The setting is beautiful, the security is great, it’s well maintained on the outside. Very peaceful and quiet with main shops only a 10 minute drive down the road. I asked for extra pillows and they were very accommodating and supplied the pillows the next day. Lovely apartments. We had a sea view with our own plunge pool which was great. Grounds are beautiful and very well kept. Would definitely return. Everything was great apart from beach area by apartment which was pebbly and not much sand. The main beach in Estepona and El Cristo beach is beautiful sand and safer for children. The apartment was lovely and clean and we had everything we needed for our stay. Comfy beds and plenty of outdoor space to eat and sunbathe. Plunge pool a bonus, as was the indoor pool and steam room. The outdoor pool opened at the end of our stay and was thoroughly enjoyed despite the temperature of it! Maned security 24hrs to collect keys. Anything you required left in the apartment. Excellent gym, indoor spa pool and steam room. Quiet areas on site to sunbathe. Heating in the apartment at this time of year makes it very comfortable. Beautiful Apartment top quality.Only problem its very dark inside and in springtime sun only stays on terras until 1pm.In summer the terras would be lovely to relax in the shade and the little pool is a bonus This isa very high quality Apartment.. Lock in a great price for Bahía Boutique Apartments – rated 8.8 by recent guests! 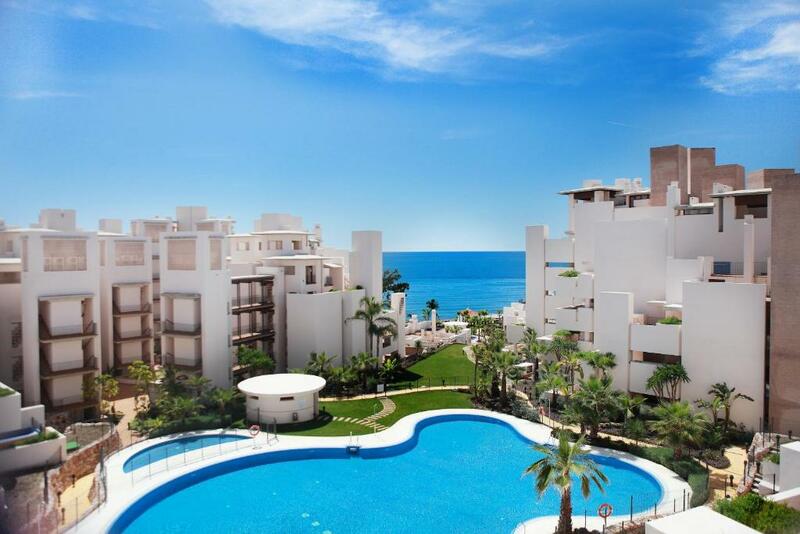 One of our top picks in Estepona.Bahía Boutique Apartments is located in Estepona, 350 feet from the beach. These stylish, air-conditioned apartments offer access to 2 shared swimming pools. Each apartment has a living room with a sofa, dining area and flat-screen TV. A washing machine, oven and microwave are included in the kitchen. The bathroom comes with a hydromassage shower and a bath tub. Bahía Boutique Apartments features a fully equipped fitness room, indoor pool, steam bath, and paddle courts. Free private parking is available. There is a shopping center 1.2 mi from the apartment. Estepona city center is 1.9 mi from the property. Caledonia Golf Club is 1.2 mi away. Marbella can be reached in 20 minutes by car. This property is also rated for the best value in Estepona! Guests are getting more for their money when compared to other properties in this city. When would you like to stay at Bahía Boutique Apartments? Featuring a furnished terrace with sea views, this air-conditioned apartment has a living room with a sofa and flat-screen TV. A washing machine, oven and microwave are included in the kitchen. The bathroom comes with a shower. This 2-bedroom apartment features a private pool with impressive sea views and a terrace. This beachfront penthouse apartment has 2 bedrooms, 2 private furnished terraces and a private pool. This penthouse has a private rooftop pool and sea views. There are 3 bedrooms and 2 complete bathrooms. This spacious apartment has a private furnished terrace and a fully equipped kitchen with an oven and dishwasher. This apartment features a private entrance, toaster and dining area. This apartment features a terrace with private swimming pool and views of the sea. Our exclusive frontline beach Boutique Apartments are located in the newly built Bahia de la Plata urbanization in one of the most sought after areas on the Costa del Sol – the New Golden Mile. All our boutique apartments have been furnished using modern Danish design furniture. The exclusive urbanization boasts two outdoor pools with children’s pool area and magnificent indoor facilities where you can find a heated pool, steam bath, fitness room, covered paddle court and indoor space for social activities. Our onsite office, the 24 hour security service as well as the tranquil area ensure our guests the ultimate in secure and confortable holiday rentals on the Costa del Sol. House Rules Bahía Boutique Apartments takes special requests – add in the next step! Bahía Boutique Apartments accepts these cards and reserves the right to temporarily hold an amount prior to arrival. Please note that from 8 November 2018 until 31 March 2019 inclusive, the outdoor pool will be closed. During this time, the indoor heated pool with remain open. Needed better directions to the hotel and instructions on where to collect the keys and locate the apartment. We drove into the underground car park and then drove back up, convinced we’d gone wrong, until I managed to get the attention of the security guard who had the keys and a map. The architect and structural engineer need a kicking for making the car park so tight. Bit of a white knuckle ride each time. You can park on the street outside but if you’re a nervous driver, you’re not going to like the underground car park. High spec apartment with plenty of space. Lovely outdoor terrace and views. Pools fenced and closef. Whilst I would not expect to use pool in March and April it would have been nice to sit on lounger by the pool. Beaches grey and pebbly - not nice, although we are from Devon so high expectations. Slight noise transfer from adjoining apartments a little annoying. Beautiful pools ,but closed until 1st of April and no deckchairs.Would have been lovely to enjoy the sun by the pool. The complex and the apartment itself were superb. Couldn't fault anything there. Lots of things to do within a relatively close distance but I would recommend hiring a car due to the location. Very dark in the corridors during the day. The hallways to the doors of the apartments are very enclosed and dark don’t think I would feel safe on my own at night. We arrived on a Sunday and reception was closed we collected the keys from security was ok but not the easiest, as security could not speak a word of English. It was as if he didn’t know we were arriving. We left early Friday morning before reception opened I didn’t know what to do with the keys so left them with security this was the only bit of communication /instructions that wasn’t handled well. Amazing facilities, pool on balcony, indoor pool was beautiful.size of apartment. Good gym. Communication before our trip was excellent, booking transport to and from the airport was excellent and arranged by reception. Location on sea front is great, sea view is beautiful. Walking distance a nice stroll to Laguna beach shops, restaurants & beach clubs. Very quiet complex. Beautiful gardens. Very friendly staff. No shops in the area, car needed. Poor guidance/signage within the resort. Very tight parking garage. The separate beds in the small bedroom are only 80cm which was irritating. Amazing apartments, great location next to the beach. Will defo be returning, lovely apartment with great shower and private pool on balcony. Apartment was fantastic - big rooms, fully fitted kitchen, two bathrooms, two large terraces. Indoor pool was clean and warm. Next door apartment very noisy. Couples screaming at each other having a domestic in the early hours of the morning ! chairs being scraped on the floors. Walls a little too thin to adjoining apartment ! We loved the location of the apartment, great views and access to the beach and the promenade for walks, beautifully maintained communal gardens, as we visited in December the kids loved indoor heated swimming pool. The apartment was spacious and clean, kitchen had all necessary utensils. We had a lovely time, and having a great accommodation was very important for us as we are a bit picky, but we were not let down! Thank you!